We can, if we so choose, wander aimlessly over the continent of the arbitrary. 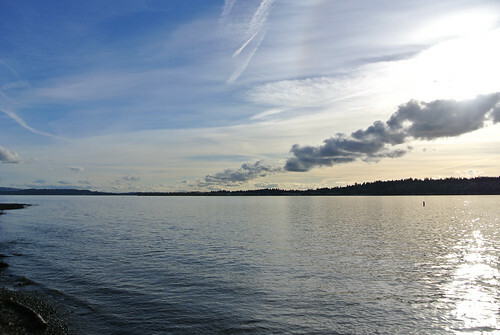 Sunday January 24th was a splendid winter day. 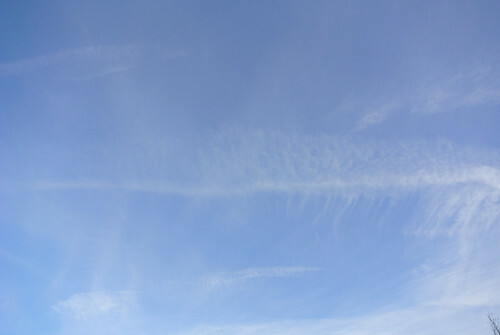 The sun was out, chased around the sky by big fluffy cloud ridges. In the sun I was overdressed and hot but when the sun was behind a cloud it was definitely winter. I wanted to outside, but I didn’t have much of a plan. I left around 11am so I knew that I’d been need lunch. I also wanted to get over to the Eastisde but I wasn’t sure where exactly over there. Heading to the eastside means the Mountain to Sound Trail so I headed straight there. 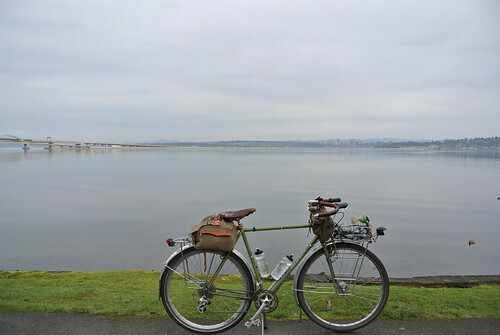 At the Mount Baker Tunnel, my plans crystallized and I rode down to Leschi at picked up provisions at the Leschi Market. I had to get back to the Mountain to Sound trail but I didn’t want to just backtrack. So I road along Lake Washington until I went under the I-90 Floating Bridges and then up the great winding road through Coleman Park. There is a huge P-Patch at Coleman Park and it is a testament to the warmth of this January that there was plenty of work going on there. Getting ready for spring. 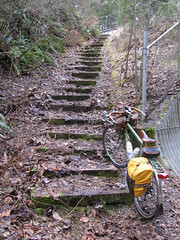 This route takes you above the Mount Baker Tunnel and after a short stop for photos, I descended onto the bridge. It has become such a routine ride now: across the floating bridge, leave the trail and ride the perimeter road around Mercer Island. Then it’s the second floating bridge and you are on the Eastside. But today I stopped at Luther Burbank Park for a picnic lunch. 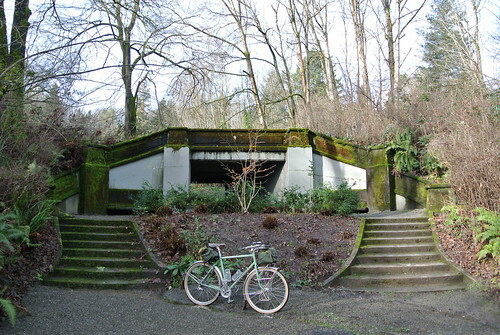 I rode down into the park on it’s dirt paths winding around the earthwork The Source to a picnic spot right on Lake Washington. It was warm enough here in the sunlight that I took off my sweater as I unpacked my picnic supplies. 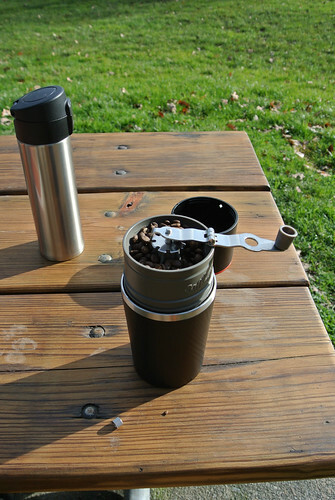 I had planned on making coffee as well on this trip and I brought my Cafflano – an integrated burr grinder, drip filter and drinking vessel. Instead of boiling my own water I brought a thermos of hot with me. I have to say this worked out well and I had the best cup of coffee I’ve maid out-of-doors. 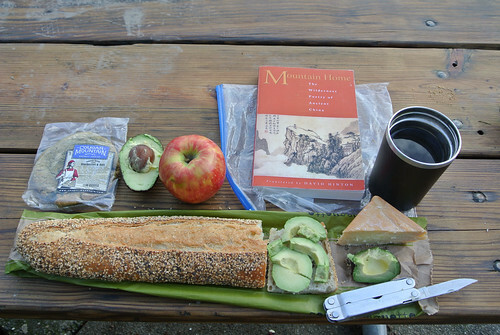 Lunch was a baguette with smoked cheddar, avocado and an organic honey crisp apple. Really enjoyable. The park, like all of the parks I’d go by/through on this day, was quite active as us PNW’ers don’t pass up a warm winter Sunday to get out. 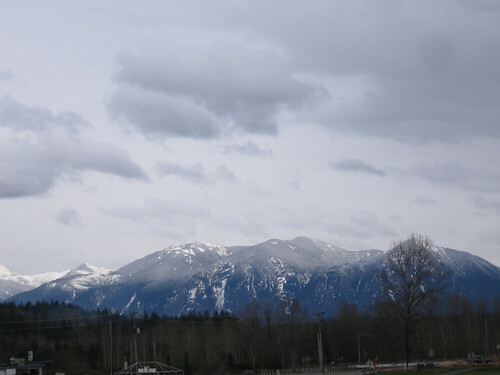 Sitting here on the edge of the park I can see out to the Cascades which look tantalizing as if brushed with snow. I began to feel the stirring in me, drawing me to the mountains. But I couldn’t go them on this day. A thousand parks: no more birds in flight. Ten thousand paths: all trace of people gone. 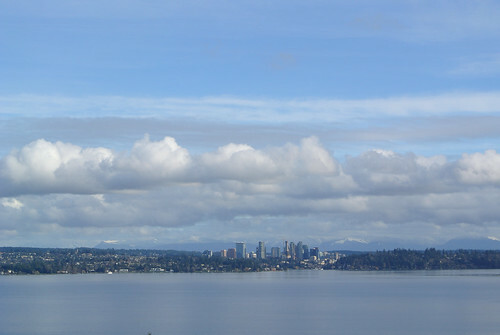 I’d decided now that I’d ride the north end of the Lake Washington Loop which provides for a nice ride along the lake with some hills and would take me through Bellevue, Kirkland, Lake Forest Park, Kenmore and back into Seattle via the University of Washington. This is a familiar route, but I don’t do it so often these days. It was a great day for this ride and I did take a few jogs off the route for better sights and around more parks. In Bellevue stopped at Cafe Cesura and had them put loose leaf green tea into a tea bag and refill my thermos with hot water. 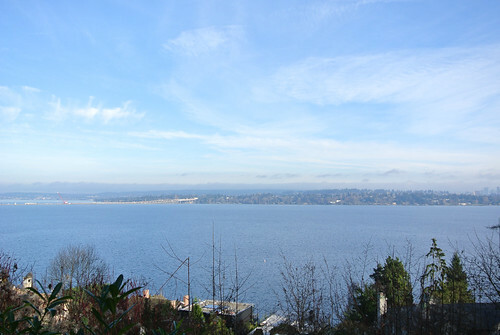 In Kirkland I turned off the loop to ride up Waverly Way past Heritage Park and on a bluff above the lake. 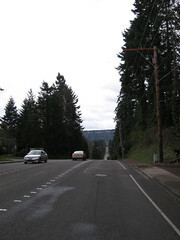 Then it was hill climbs up Market Street in Kirkland and then up Big Finn Hill from Juanita. Once again I dropped off the route, dropping all of the elevation I’d just gained back to the lakeside at Holmes Pt. Down there among all of the McMansions is O.O. 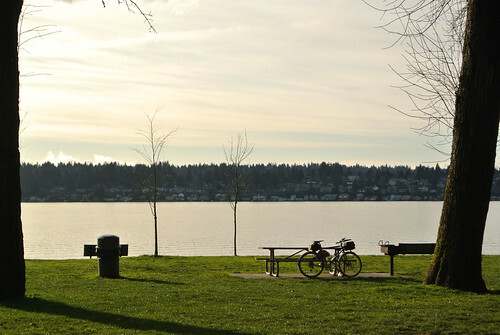 Denny Park, a nice big stretch of open space right on the lake with expansive views north and south. I stopped here and made my tea and did a bit more reading. After lingering a bit I reached that time where I’d have to leave if I wanted to be home before dark. I had to climb up from Holmes point but then it was the long descent down Finn Hill. 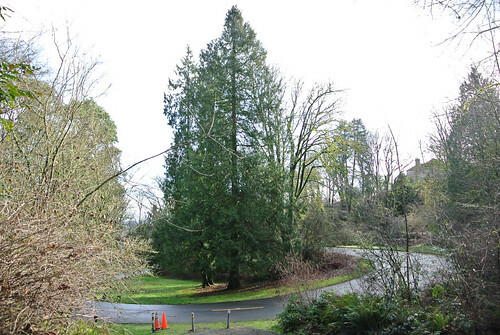 This take you to Kenmore and the intersection with the Burke Gillman trail at Logboom Park. I tend to avoid the trail on sunny weekend days, but I the alternatives are a lot hilly and longer, so I decided to just cruise back into the city. Well it wasn’t so bad — people were definitely out, just like at all the other parks, but it wasn’t packed. I made good time one the trail and the times were the lake was visible there was very tantalizing views of the mountains in the distance. The dwindling sun was coloring the sky with soft pinks and purples. 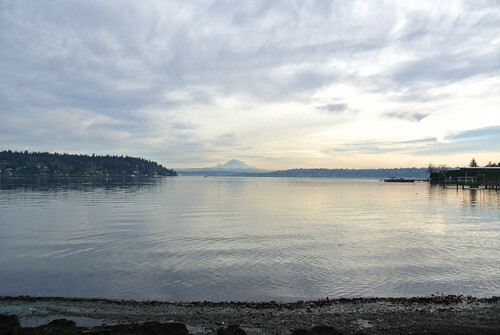 Everyone once in a while I could glimpse Mount Rainier which was obscured by clouds when I was in my prime viewing spots. No good place to stop for pictures when I could see it, so Mount Rainier amidst torn up purple clouds will only remain recorded in my memories. 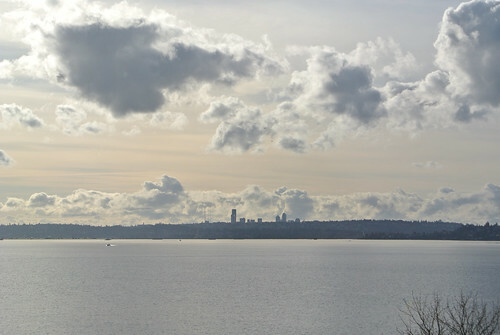 Once I arrived at the U-Distrct it was back on the Lake Washington Loop through city neighborhoods. 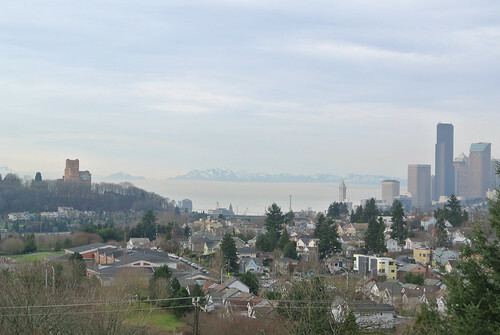 I left it on my old commute route along the backside of Capital hill, which let me make my way back to the Mountain to Sound Greenway which I could connect to the Beacon Hill Greenway and then back home. A lovely day of riding with a mix of winter scenery, tea, snow dappled mountainscapes, blue skies, good coffee, mountain poetry, food out doors and 75km of riding. The beginning of 2015 found me waylaid by a cold and thus I didn’t get out on my bicycle until January 5th 2015. As per my wont I didn’t get out of the house until late and I ended up doing a fairly standard ride here in the Puget Sound area: South Lake Washington Loop. I rode the anti-clockwise on the loop from the I-90 trail on the west side to the I-90 trail on the Eastside. 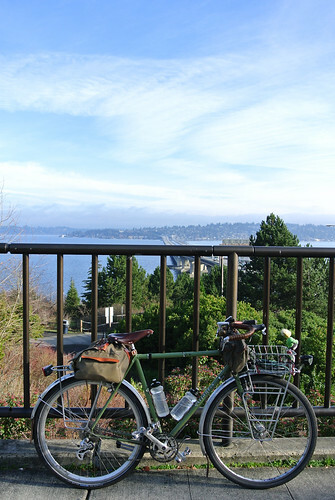 Then I rode the south half of the loop around Mercer Island before return to the westside. Two days later I did the North Lake Washington Loop again in between the I-90 trail and this time the north half of the Mercer Island Loop. It has been clear and cold with an inversion layer keeping in fog and smog, which presented some pretty views which I’ll present some photos of here with captions. For more pictures check out my First Rides 2015 photoset on Flickr. 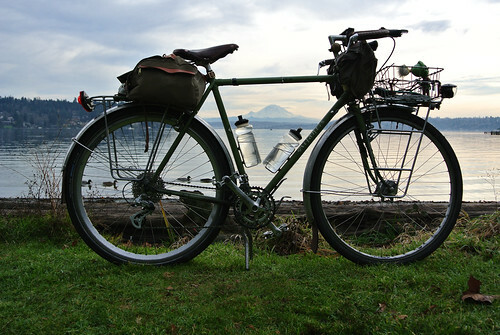 Today, the shortest day of the year, is also the last day I’ll be riding in 2011. Tomorrow I set off to visit family for the holidays and won’t return until 2012. 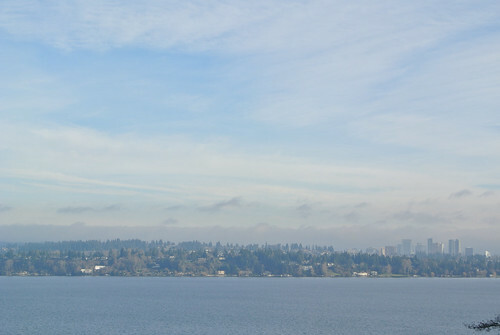 Once a week I ride (mostly; I’ve taken the bus a couple of times) over to Bellevue, which is just across Lake Washington, to have lunch with an old friend. 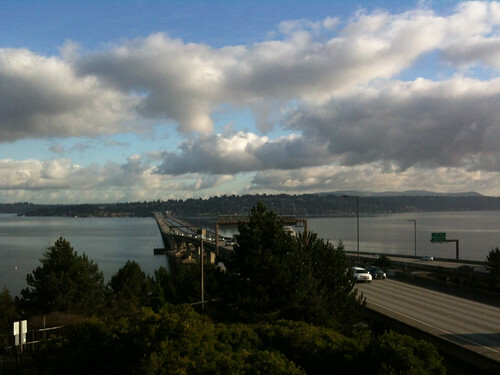 Due to not being able to ride on the 520 bridge I have to take the much less direct route riding to the I-90 Bridge. This makes for a nice bracing ~15 mile ride, along Lake Washington, then on the floating bridges, followed by a route across Mercer Island and finally through downtown Bellevue. It’s made for a nice weekly ride through in this period of unemployment where I don’t have the daily commute to keep me riding. Anyway that’s it for the year. It’s been a roller coaster ride this year: serious overwork in the early months, jury duty, moving out of the house I’ve lived in for years, loss of my job of 12 years, spending a month with friends and on the road, moved into Seattle and on and on. But overall I’d say this has been a pretty decent year for riding, though it started off pretty weak due to that excess of work early in the year. 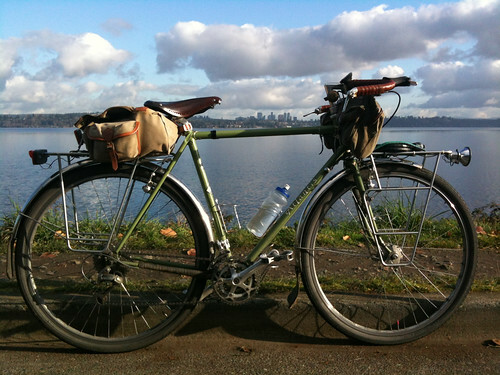 But I ended up doing a good tour, rode some new routes, rode a bunch of old favorites and on moving into Seattle a lot more urban and a lot more utility rides. I ended up riding 3358 miles (5404 km) on my Atlantis this year (with some unknown amount on my Safari before I sold it), which puts it as about an average year for me. But considering what a topsy turvy year it has been that’s not so bad. So here’s to the returning of the light and even more riding next year. 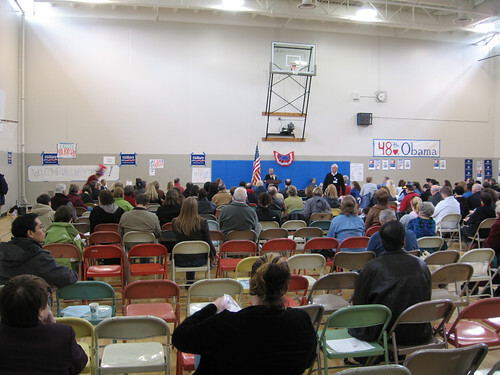 So at the democratic caucus on February 9th I’d volunteered to be an alternate delegate for Obama. Well last Saturday, April 5th, was the next step in the process. The location was only about 6 miles from me and all of the mailings were going on about parking issues so I swore I’d ride in. The weather was forecasted for rain and the sky was gray with large black clouds. Still it wasn’t raining at that actual moment so I kept my word. There was some wind blowing those clouds around but they also kept the heat in so it was a fairly pleasant ride to the school in Bellevue where the caucus was. There were a couple of hills and as I entered the suburbia where the school was the bicycle lanes disappeared and the traffic picked up a bit. I made it over there about ten minutes early and as I was locking up my bicycle I saw a couple of other people had ridden in as well. There was a good stream of people coming into the caucus and as I went through registration and then to the gym where my district was meeting I was happy to see that the excitement over this election was continuing on. There is nothing like 8 years of failure and horror to get people motivated. Gives one a little bit of hope. I ended up not being needed as an alternate, which is good you ask me as it means that all of the delegates from my district showed up. So I got to see some speeches from supporters of the two remaining candidates and witness a bit of democracy in action. Around noon I was free to go and with the weather still holding up I decided to ride up to Snoqualmie Falls and get lunch at the Snoqualmie Falls Brewery. 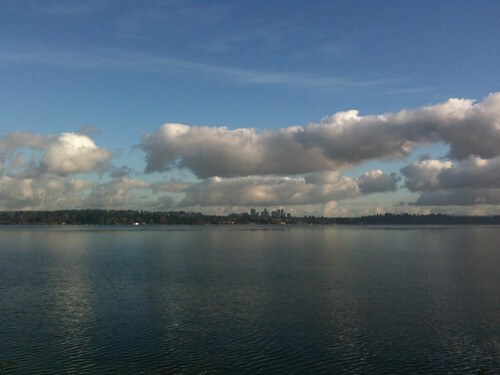 I headed out from the school toward Lake Sammamish on a road I hadn’t ridden before. It had a nice bicycle lane all the way down to the lake and featured a massive hill where I hit nearly 40 miles per hour. It’d be a pretty serious climb up, I’ll have to try that sometime. 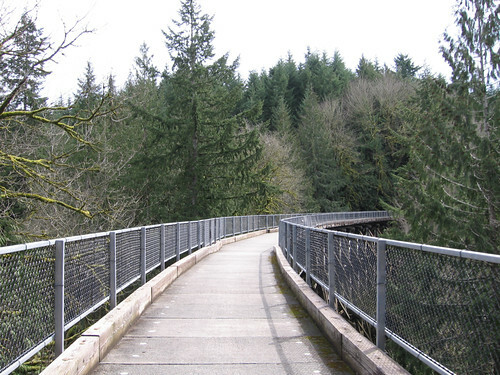 Once I intersected with Lake Sammamish Parkway I was on a familiar route – around the lake to Issaquah and hop onto the East Lake Sammamish Trail. Only about a half a mile on this gravel trail there is a new trail segment that parallels I-90 before it joins the old dirt path that is the Issaquah-Preston Trail. This is one of my favorite routes, one that I had worked out several years ago and is a fantastic mixed terrain route. It utilizes three or four rail trails (depending on where I’m going) and numerous country roads connecting it all together. This was the earliest in the year I’ve ridden this trail and being dirt there was a decent amount of puddles and mud on the trail. Really nice though, the trees a mix of buds, new leaves and bare branches and the river running full and furious. The weather was classic spring- occasional sun breaks, occasional raindrops, wind and ever present big clouds rolling through. The wind was coming from the northeast, which was my direction so riding these trails through he woods helped diminish the headwind. From the Issaquah-Preston trail there is a nice connector on country roads to Preston where the Preston-Snoqualmie Trail begins. I stopped at a cafe there for a bottle of water, a truly perfect cappuccino and a peanut butter cookie that had an entire Reeces Peanut Butter Cup in the middle. Somewhat refreshed I hit what is probably my favorite trail I’ve ever ridden on. 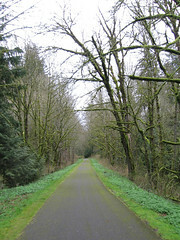 This trail is paved and in the woods and as it veers away from I-90 is relatively quiet. Really a nice ride on this well maintained tree lined path. 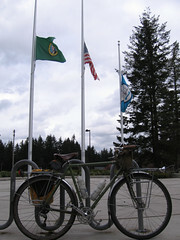 This time I only rode half of it and where it crossed the Preston-Fall City road, I took that road down to Fall City. This is a decent road with a good shoulder but also a pretty steady stream of fast traffic. Still I had no issues and as it was all downhill from where I started was quickly in Fall City. Which I just as quickly rode through and after crossing the Snoqualmie River took a little road that dead-ends at dirt road you can take up to the Snoqualmie Valley Trail. My fourth trail of the day, this long gravel surfaced trail is another favorite. 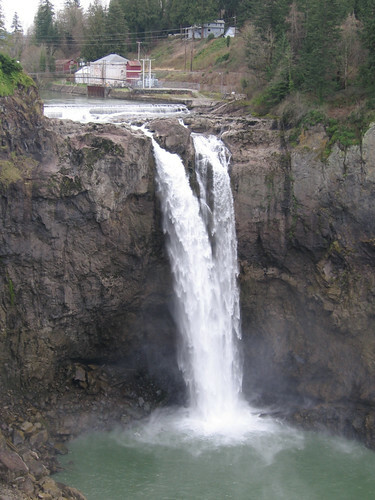 It runs through the Snoqualmie Valley with its open vistas, and then climbs through the woods all the way up to Snoqaulmie Falls at a gentle, rail friendly grade. The surface was hard packed dirt at first and then there was a section of new fairly loose packed gravel. Right around the point where the surface changed I began to hear gunfire. Clearly down the valley but always a nerve wracking situation. I’d hear shots on and off for the next half hour or so, but luckily there was no stray bullets in my direction. I was only on this trail for about 5 miles and then I was at the end and back on the road. Trestle on the Snoqualmie Valley Trail. The trail ends at this little tunnel under Tokul road and you have to climb this steep stairway up to the road. Once there its a nice road through a heavily wooded route down io Snoqaulmie Falls. A car came up behind me as I rode this section and it held off passing me as there was a lot of blind curves in this section. As I came around one of these I startled a deer crossing the road toward a pair of fawns on the other side. They looked at me and then bounded away into the woods. Shortly thereafter I reached the end of the road and then I rode into the quaint little town of Snoqualmie. 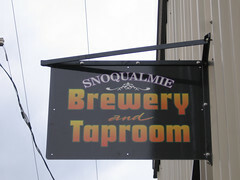 I was quite hungry at this point so I rode straight to the Snoqualmie Brewery Taproom, my first ever visit to this brewpub. I’ve enjoyed their beers in bottle form and was excited to have a chance to have them on tap. The brewpub was fairly small and fairly full of people but I got a seat and soon had a porter in front of me. I had sandwich and an Oatmeal Stout (more on this in another post!) and spent some time resting and checking my email. Then it was back into town where I walked around a bit bought a bottle of water and checked out the main drag. Soon enough I felt time weighing on me and I headed out. The descent from Snoqualmie Falls into the valley is a good time and now the wind was with me. Pretty soon I was back in Fall City and now I turned onto a bit of the route I did just a couple of weeks ago on my spring “populaire” ride. I didn’t follow that route for long, abandoning it right at Carnation to cross the Snoqualmie River and take this winding country road that I had first ridden on the Flying Wheels Century route. At this point I was at about 55 miles of riding and as the road turned into the wind was definitely feeling it. I rode through this farmlan head down against the wind just turning the pedals. 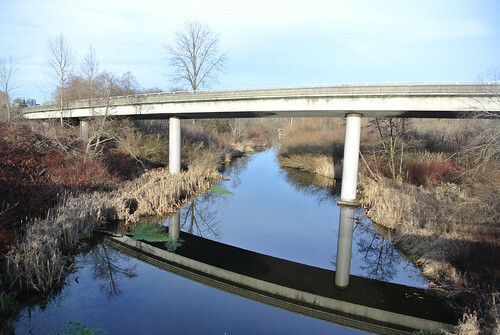 The route ended at the Redmond-Fall City road which I so often seem to end rides in this direction on. Check out my full picture set of this ride on Flickr. A record of my wanderings, be they by bicycle, camera, foot, or just daydreams.